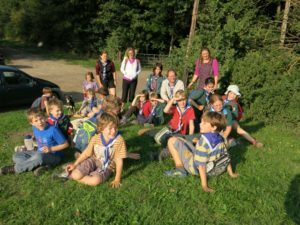 Cubs is the second section in the scouting family, after beavers and before scouts, and is open to girls and boys from the age of about 8 to 10 1/2 years. Cubs make a Promise to do their best, to do their duty and to help others. They play games, go on outings and visits, go camping, learn about the outdoors, gain badges and create things. When we’re not out and about, our Monday Pack meets on Monday Evenings. 6.30-8.00 at the Scout hut on Gilbert Road. Our Saturday Pack meets twice every half term from 11.30 – 4.00 at the same place. The cubs had a great time on what was probably the last sunny Sunday afternoon of the year, geocaching in the hills west of Cambridge. Fantastic views, and a great opportunity for map work!